The Discovery Project’s education program in Ghana, Kenya and Nigeria is helping marginalized girls like Joyce make huge strides in learning. Funded by the UK Girls' Education Challenge, the Project is part of an initiative to help at least 1.5 million girls attend and stay in schools. Amidst the many global challenges addressed at this year’s UN General Assembly, I was heartened that SDG 4 (education) and 5 (gender equality) were prominent, and that world leaders recognized that we can only achieve these and other sustainable development goals through stronger partnerships (SDG 17). However, even as another International Day of the Girl Child approaches, the UNESCO Institute for Statistics (UIS) reports that over 130 million girls remain out of school. These aren’t just numbers. There is a beautiful face and name to every one of these 130 million – each of whom deserves an opportunity to learn. Joyce,* a Class 8 student at a school outside Nairobi, Kenya, was born to a single mother and raised by her grandmother. She entered school for the first time when she was around 10. Despite not being able to read or write, she was placed in Class 5 due to her age. Joyce continued moving through subsequent grades as per school policy. Struggling to follow lessons in class, she seldom turned in assignments. Her teachers branded her a “hopeless” case. A few months ago, Joyce’s life began to change. Her school began participating in the Discovery Project’s literacy and numeracy classes for students who are at risk of falling behind. Launched by the Discovery Learning Alliance (DLA) in three Global Partnership for Education (GPE) partner countries – Kenya, Nigeria and Ghana – the project is funded by the UK government’s Girls’ Education Challenge, an innovative initiative to get at least 1.5 million girls into schools and learning. After just a few months of receiving instruction at the right level, Joyce’s ability to read age-appropriate vocabulary has improved from 5% to 50%. 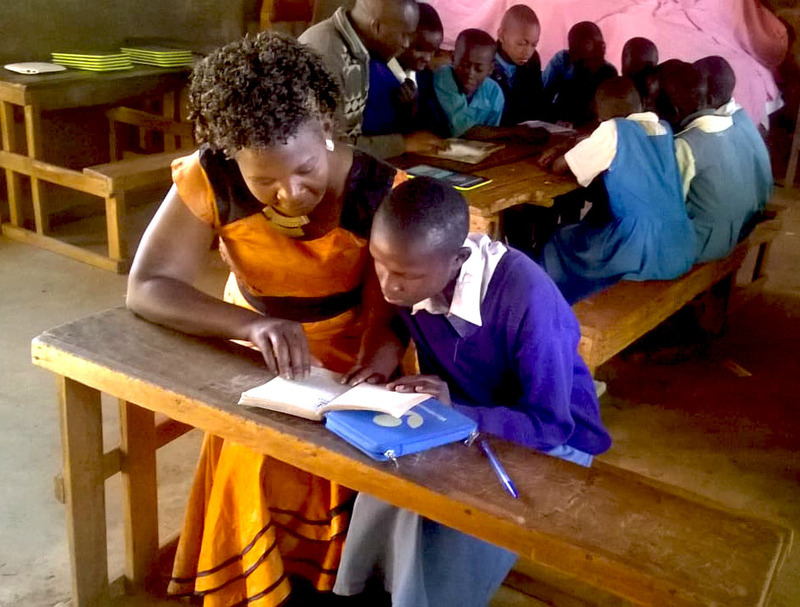 She actively participates in an after-school reading club that gives her continued access to reading materials and regular support from teachers trained in remedial learning. 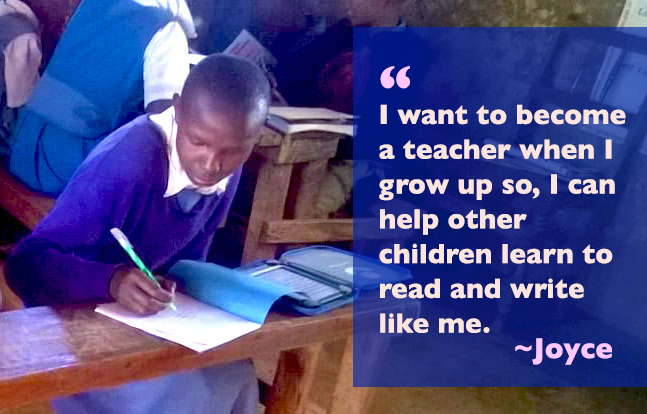 Once struggling to follow lessons, Joyce is now often the first in her class to volunteer to read. With her newfound confidence and improved learning, Joyce has begun to envision new possibilities. For the first time in her life, she looks forward to going to school. "I feel good that I can read. These days I read loudly even for other pupils to hear because I know I will read well," Joyce says. Just as alarming as the number of girls who remain out of school is the fact that less than two-thirds of girls in low-income countries who enroll in primary school actually finish. Just one in three completes lower secondary school. Girls like Joyce, who enroll late and may lack support, see little reason to stay in school unless they experience a nurturing learning environment that meets them where they are. Already facing barriers like early marriage and pressures to contribute to household income, these at-risk girls are more likely to drop out before becoming fully literate. Low learning levels in early grades lead to millions of children leaving the system before acquiring the most basic literacy or numeracy skills. Since filling classrooms is not the ultimate goal, the question becomes: how do we make schools great places to learn, particularly for girls? Investing in teacher professional development grounded in the science of ‘mind, brain and education,’ which helps teachers bring learning to life and life to learning, in and outside their classrooms. Amplifying the voices of children and youth through technology and media. Exciting, relevant content engages students and teachers in ways that make learning dynamic and memorable. Understanding barriers to gender equality to co-create initiatives that get more girls in school and learning. Building partnerships that catalyze innovative, systemic solutions to enable youth everywhere to learn the skills for today and tomorrow. Parents, educators and students alike are trying to keep up with the skills required to compete in our fast-changing world. In underserved, and often remote communities, we see exciting results by engaging communities to develop their own solutions to overcome barriers to education, and training teachers to equip their students with skills for the future and incorporate content specifically designed for their use. Building on such feedback and in line with DFID’s 2018 education policy, we’ve taken our program one step further. Through our new series of literacy and numeracy videos for classrooms and after-school clubs, students actively follow the adventures of a brother-sister duo and their animated friends. Teachers are trained to use these videos to increase student engagement in literacy and numeracy activities and foster problem-solving and critical thinking. The power of visual learning is a tool for lasting change among learners. One compelling evidence of success is the increased confidence among girls, particularly those mentored in girls’ clubs we help establish in school communities. One teacher in a conservative, rural community told us, “They are now able to talk to me without looking down or covering their faces.” That ability to make eye contact and speak one’s mind is a significant milestone for girls who have had few choices in life. To build more creative and sustainable learning environments that help girls stay in school and develop skills for the future, we actively listen and form dynamic partnerships with their communities and governments, as well as nonprofits and private companies. For example, we partner with Cell-Ed, a social enterprise that provides a mobile learning platform to extend DLA’s in-person teacher training. The satellite company, Avanti Communications, provides technology to deliver DLA’s educational content to a growing number of our project schools. We are also working with the Campaign for Female Education (Camfed) to adapt their life skills and wellbeing curriculum into a part-animated video series for adolescents, following the adventures of six African teens as they navigate the challenges of school, family and friendship. Through these and future partnerships, we are confident that we can give the next generation of girls, and boys, the skills and confidence that enable them to end cycles of poverty, and create a world where everyone has equal opportunity to thrive.